THC is the main psychoactive component of the cannabis plant. In other words, THC is the primary agent responsible for creating the ‘high’ associated with recreational cannabis use. This compound works, in part, by mimicking the effects of anandamide and 2-AG. These neurotransmitters are produced naturally by the human body and help to modulate sleeping and eating habits, the perception of pain, and countless other bodily functions. What Are the Natural Benefits of THC? Cannabidiol is one of the most critical cannabinoids contained in the cannabis plant. It exists both in agricultural hemp, as well as medical cannabis. While cannabinoids are present within several plants in nature, cannabis is the only plant known to contain CBD. CBD has the same chemical formula as THC, with the atoms in a different arrangement. This slight variance causes THC to create a psychoactive effect, while CBD does not. This fact means that when you ingest CBD for medical purposes, you will more likely experience a relief of your unwanted discomfort, with little or no noticeable effect on your cognitive abilities. Research suggests CBD may be better for inflammation and neuropathic pain, while THC may excel with spasticity and cramp-related pain. Some experts suggest that a combination of THC and CBD is the ideal way to approach pain, giving validity to something known as the entourage effect. For example, 100mg of isolated CBD may be substantially less effective at alleviating symptoms than 100mgs of a whole-plant, CBD-containing cannabis extract. Many argue that consuming the plant in its whole form provides all the necessary cofactors to facilitate proper absorption. This argument is at the heart of the debate over CBD oil from hemp vs. CBD oil from cannabis. 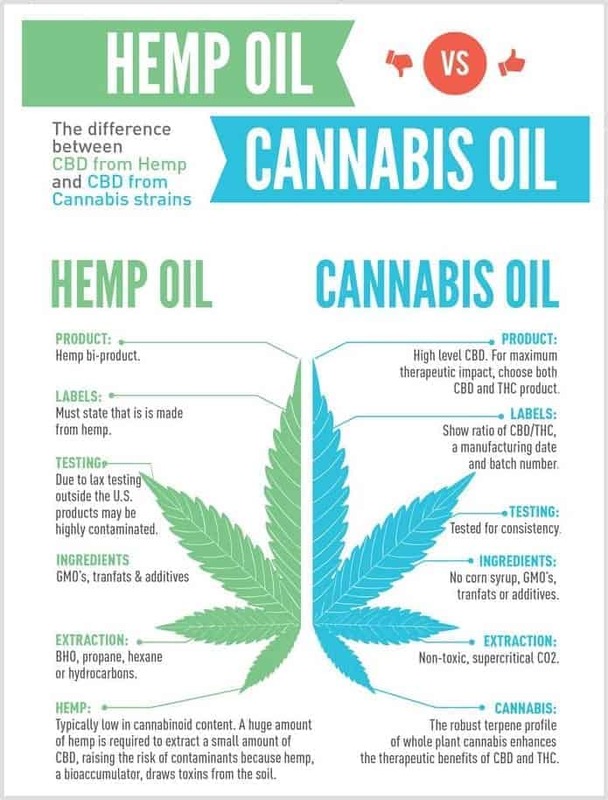 While it may be cheaper and more cost-effective to extract CBD from industrial hemp, users may ultimately experience less benefit due to the absence of clinically significant levels of terpenes and other compounds (which occur in abundance in high-CBD marijuana). While high-CBD cultivars of cannabis do contain much higher levels of various cannabinoids, terpenes, etc., it does not mean that there aren’t potential drawbacks to its use. Agricultural hemp is much closer to the kind of cannabis that one would find growing naturally in the wild, whereas high-CBD marijuana is hybridized and toyed with by growers to produce the highest levels of the desirable compounds. There is no hard science (yet!) when it comes to the theory of the entourage effect theory. It is up to each individual to decide which option is best for them. THC is an illegal drug with considerable immediate and long-term cognitive side effects. These include impaired thinking and reasoning, a reduced ability to plan and organize, altered decision-making, and reduced control over impulses. Also, chronic use of THC correlates with significant abnormalities in the heart and brain. CBD lacks the harmful cognitive effects of THC. In fact, CBD can counteract the psychoactive effects of THC. Cannabis plants containing small amounts of CBD and high levels of THC result in a stronger ‘stoned’ feeling, while plants with more CBD and less THC create a weaker, more relaxed, effect. Given the increasing popularity of medical cannabis, breeders are currently creating strains with higher CBD to THC ratios to minimize the psychoactive side effects. Overall, the lower health risks of CBD, combined with its efficacy, make it a better candidate for natural applications than THC. I’ve truly enjoyed browsing your blog posts. After all I will be subscribing for your rss feed and I hope you write once more soon!